I made Jewish Cinnamon Babka! This was my fourth attempt and finally got the taste and texture right. Babka is a yeasted bread like cake, eaten as dessert, with breakfast or as a treat anytime. In my area there are two main kinds, Jewish and Polish. 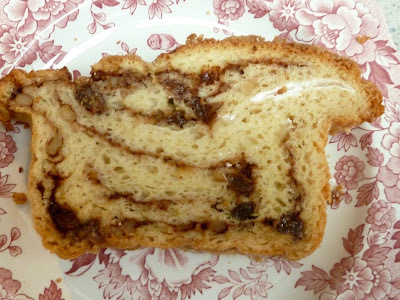 Polish Babka is similar to a brioche in texture and is baked in a bundt pan (I love Polish Cheese Babka). 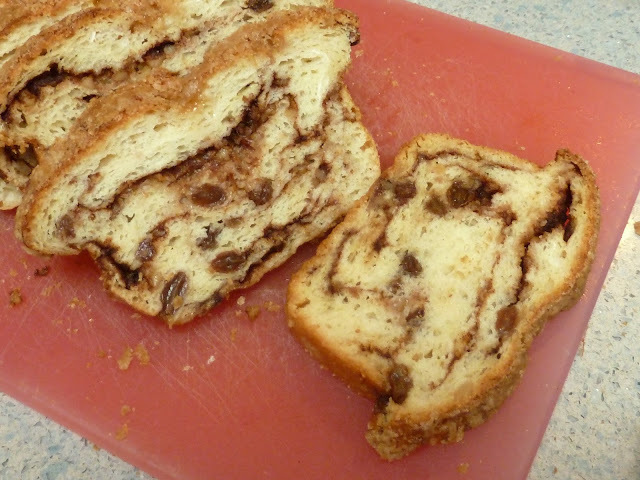 Jewish Babka is similar to challah bread in texture and its’ dough is filled, rolled up, twisted, folded and topped with streusel (a sweet crumb like mixture). 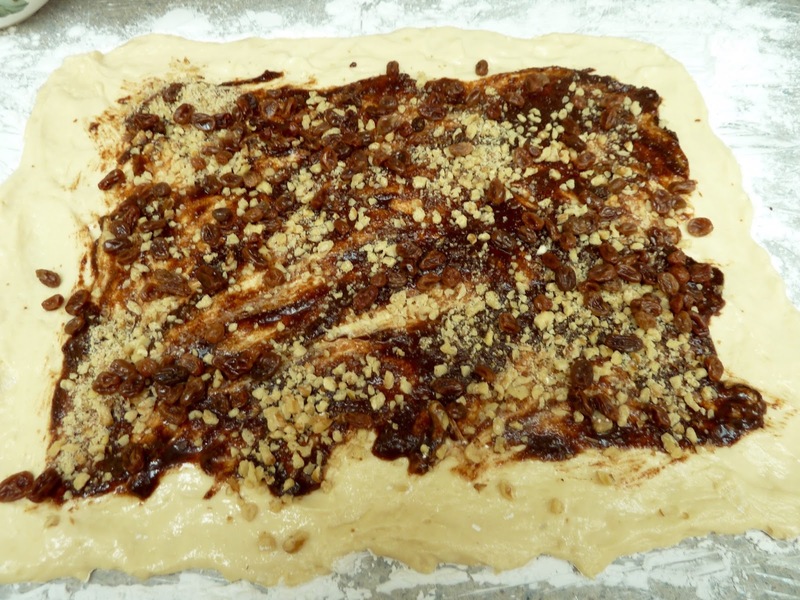 There are many types of fillings you can use in the dough, such as cinnamon, chocolate and almond. I decided on cinnamon this time. 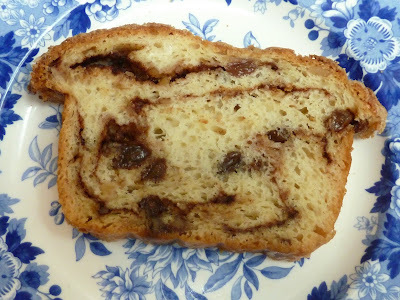 Next time I will make and post the recipe for Chocolate Babka. I tried converting Martha Stewart’s (Polish) Babka recipe first, it was good, but not the type of babka I was yearning for. 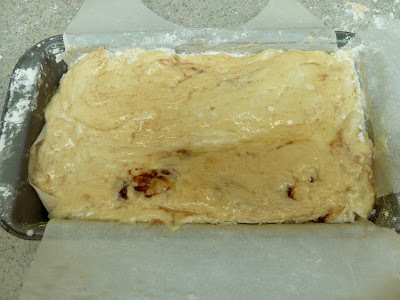 Next I converted a traditional babka dough recipe from Tori Avery’s blog into a GF version. The first one came out too dry. I adjusted the amount of flour and the second babka was much better, but still not the right texture. The dough became hard and dry after one day and had to be warm to enjoy. Then, I was going to adjust it again and try once more, but I woke up with an idea. If babka dough tastes like challah dough and originated from extra challah dough made into a treat for children, why not start with my challah dough recipe? This was just the right thing. The dough is moist and soft for days without reheating it and it tastes great! The raw challah dough is very soft and more like a cake batter than a bread dough. I knew I would have to adjust some things to form it into a loaf. I decided to lay out a few pieces of plastic wrap to cover the counter. I then put corn starch over it to keep the dough from sticking. I put too much and got some thin flour layers between some of the dough. It did not affect the taste. Next time I will try to spray the plastic with cooking spray, or oil it well, to keep the dough from sticking. Note the flour in the fold in the upper right corner. keep the dough from sticking to the plastic wrap. 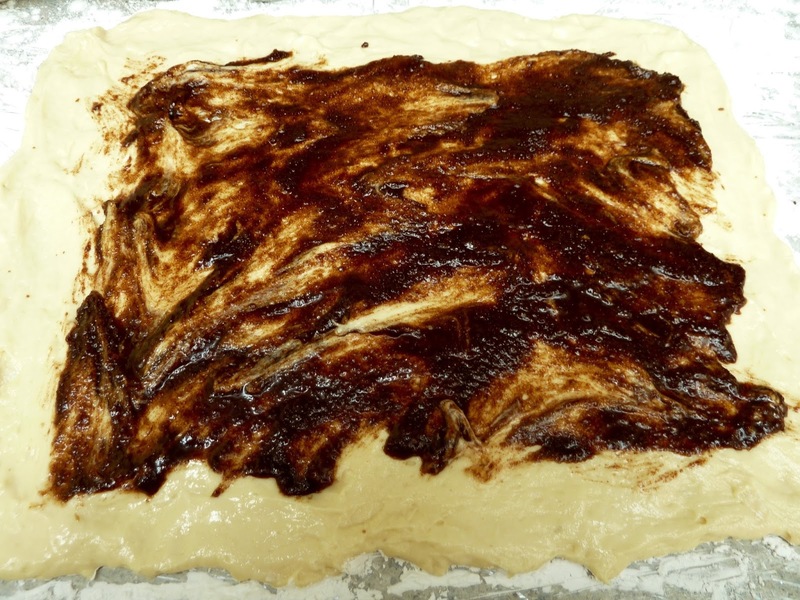 I patted the dough into a large rectangle using wet hands. Then I, brushed the dough with the filling. I had followed a recipe and mixed the sugar, cinnamon and melted butter together. It was really difficult to spread on such soft dough. It would be better to brush with melted butter first and then sprinkle the dough with cinnamon, sugar, nuts and raisins. 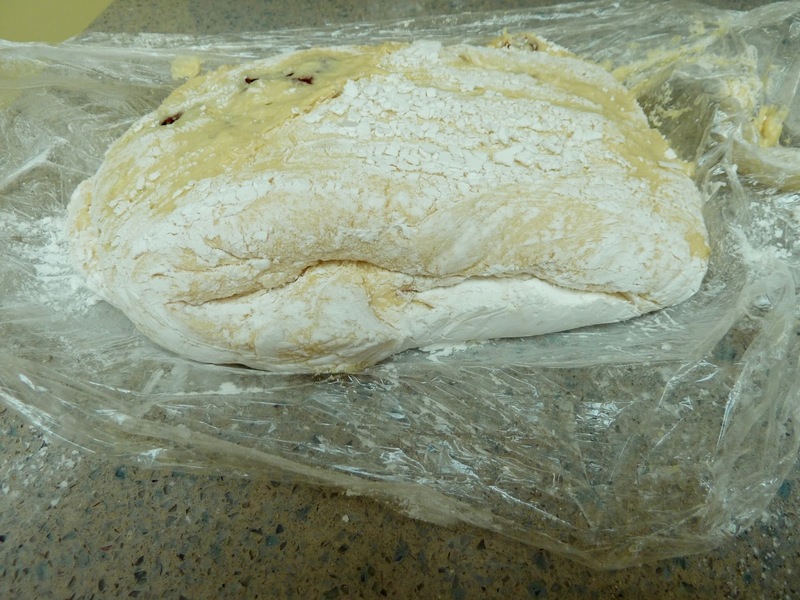 I used the plastic to lift the dough and roll it into a log. The same way you would when making a cinnamon roll. I folded the log in half and, using the plastic to lift the folded log, I put the log into the prepared pan. I should have used a larger pan, the loaf kept rising while it was baking and some of it fell over the side of the pan and onto a baking sheet, that I had thankfully placed under the bread pan. I was stunned when I opened the oven door and it looked like a scene from I Love Lucy with the dough pouring out of the pan. Because the dough was soft, it resealed itself and the finished loaf looked fine. The streusel topping is to die for, definitely use it. It is really worth the little extra time and effort and adds just the right taste and sweetness to the loaf. Yum! Raisins - soaked in hot water for 15 minutes to plump them. Prepare a warm place for the bread to rise. I like to use a proofing box or make a proofing box out of the microwave. To use the microwave, fill a microwave proof bowl with water and place in the microwave and turn the microwave on. Allow it to heat for at least 10 minutes. I let it run until the dough is prepared. When the bread is ready to rise I turn off the microwave and place the bread pan inside the microwave with the bowl of hot water, shut the door and leave it to rise, do not turn on the microwave when the loaf is in the microwave. Prepare a loaf pan by greasing it and lining it with parchment paper, two pieces, one each direction. Then grease the parchment paper. Set aside. I used 9"x5" pans, a larger 10"x5" pan may have been better and prevented the overflow of dough during baking. Loaf pan lined with parchment paper and greased. Melt the butter or margarine, set aside. Soak the raisins in hot water for about 15 minutes. Drain well and set aside. Chop nuts and set aside. Measure out the cinnamon and sugar, mix together and set aside. In a bowl mix the sugar, tapioca flour or corn starch, xanthan gum and salt, mix well. 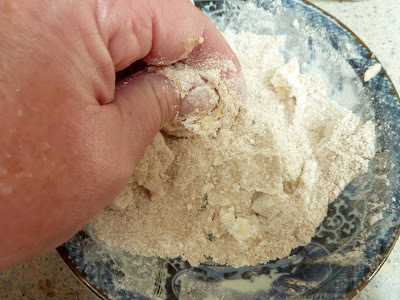 Add the butter or margarine to the bowl and pinch the flour mixture and butter between your thumb and index fingers until you get a mixture with all sizes of lumps and some sand like mixture as well. Put in the fridge until ready to put on top of the loaf. Pinching the flour and butter together to mix the streusel topping. In a small bowl add the warm water, yeast and 1 Tbs. sugar, mix and set aside. It should bubble and foam within 10 minutes. If it does not foam, the yeast is not fresh or active, or the water was too hot and killed the yeast. Start again with fresh yeast and use a thermometer to check the water temperature. 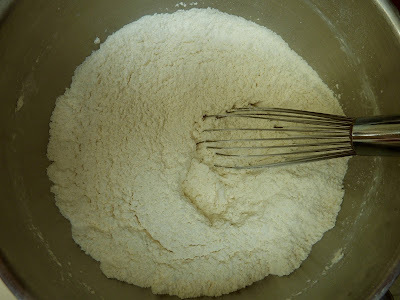 In the bowl of a stand mixer add all the flours, corn starch, xanthan gum and salt. Mix well. Flours, salt, xanthan gum and corn starch well mixed. Add the yeast mixture, melted butter or oil, sugar and honey, mix on low until combined. Yeast, oil & honey added to flour mixture. 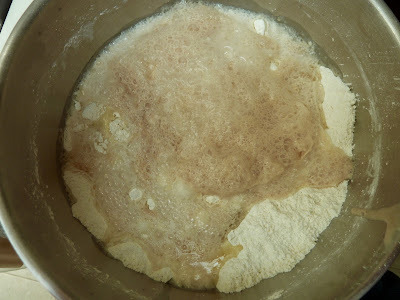 Batter after mixing the yeast and honey mixture in. Add the eggs and vanilla and mix on medium until combined. Adding the eggs & vanilla. 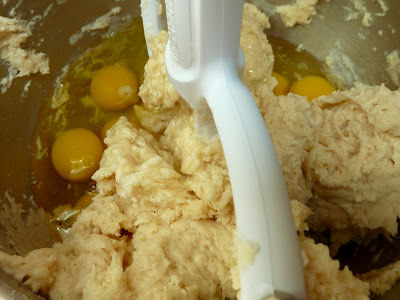 Beginning to mix the batter. 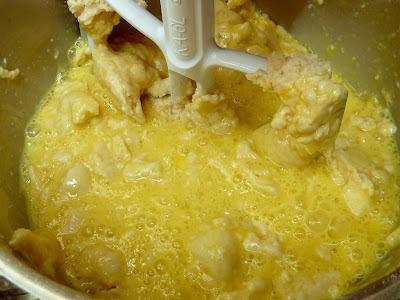 Batter after the eggs are mixed in. 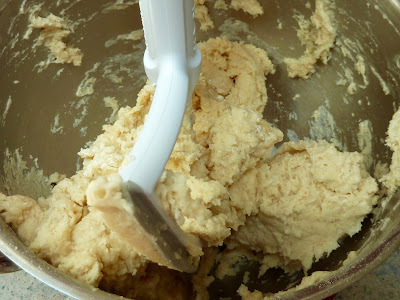 Turn speed up to high and mix about 2-4 minutes until the batter is smooth. 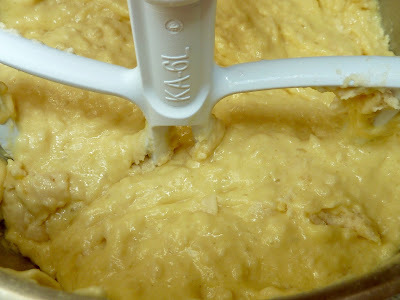 Batter after mixing on high for 2-4 minutes. Very smooth and no more lumps. Spoon the batter onto the plastic wrap. 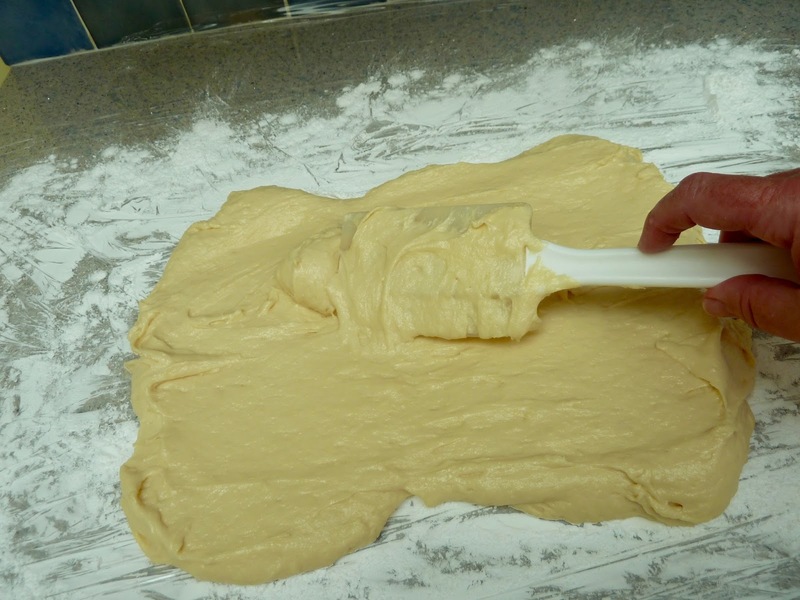 Use wet hands to spread the batter out into an 18” x 14” rectangle. Putting dough onto the prepared plastic wrap. use oil or cooking spray. 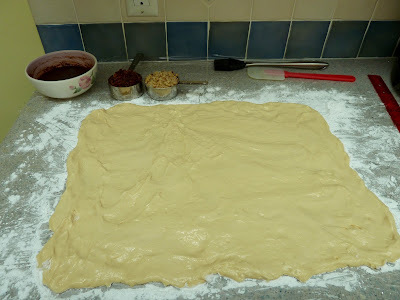 Dough spread out into a 18"x14" rectangle using wet hands. Note the filling ingredients ready to be put on the dough. Spread the melted butter or margarine over the dough with a pastry brush, leaving a 1” border around the edges. it made it harder to spread on such soft dough. sprinkle with the sugar cinnamon mixture. Sprinkle the sugar and cinnamon mixture evenly over the melted butter or margarine. Scatter the drained raisins and chopped nuts evenly over the sugar mixture. Nuts and raisins sprinkled over the cinnamon mixture. 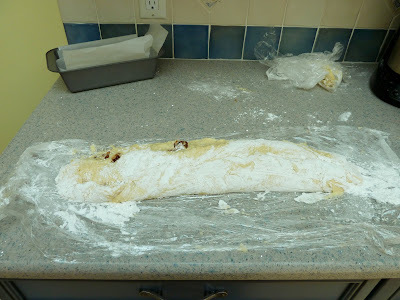 Starting with the long end, use the plastic wrap to roll the dough into a tight log. If the batter sticks, use wet or greased fingers to scrape it off the plastic as you roll up the dough. using the plastic wrap to lift and roll the dough. Use the plastic wrap to lift the end of the log and fold the log in half. Log folded in half. This will give the Babka more layers. Bring the prepared baking pan close. 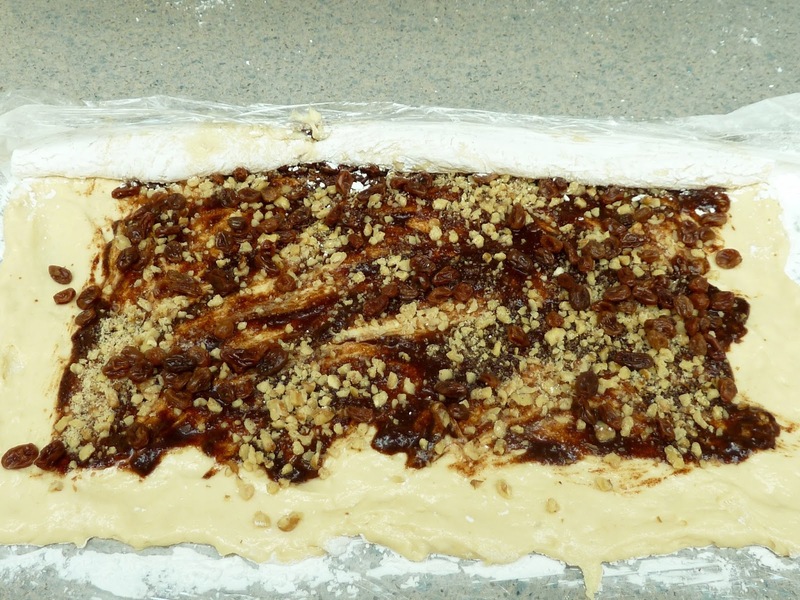 Lift the rolled and folded dough with the plastic wrap and turn it into the baking pan. Loaf in pan, brushed with egg white. Brush the top of the loaf with egg white. Allow the loaf to rise for about 45 minutes until it reaches the top of the pan. Place one oven rack in the center of the oven and one below it with enough room for a baking pan to fit easily on the lower shelf. Preheat the oven to 350℉ (after the loaf has been rising for about 20 minutes). Place a baking pan with some water on the lower shelf in the oven. When the oven is at the correct temperature and the Babka has risen to the top of the pan prepare to bake the Babka. since one loaf overflowed during baking. One babka is diary free and one has dairy. 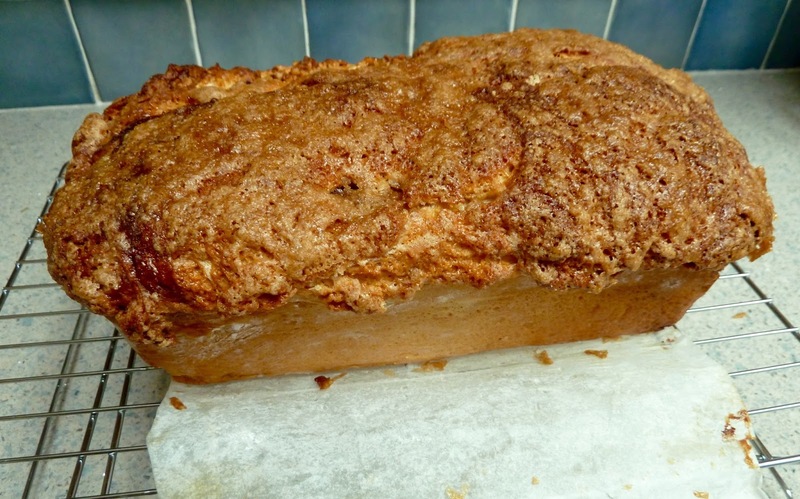 Take the streusel out of the fridge and sprinkle it evenly over the top of the risen loaf. Place the loaf pan on top of a baking sheet and place in center of the center oven rack. Bake for 45 minutes or until the internal temperature of the loaf is between 195 - 210℉. If the loaf is getting too brown during the last 20 minutes of baking, cover loosely with aluminum foil. When done baking, place the pan on a baking rack to cool for 7-10 minutes, then, using the parchment paper, lift the Babka out of the pan, to cool on the rack. Babka cooling on a rack. The streusel melted because I put it on while the loaf rose. 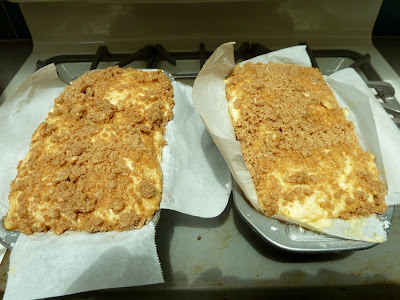 I think the streusel will stay in clumps if kept chilled and added just before baking. 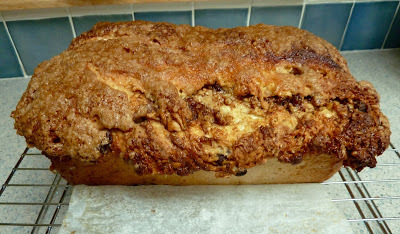 The I Love Lucy side of the Babka that over flowed while baking. You can serve it warm or cold. Slice with a serrated knife. Enjoy! GLUTEN FREE JEWISH CINNAMON BABKA Makes one 10x5 loaf. Ingredients DOUGH 1 Tbs/10 gm Yeast 1 Tbs/13 gm Sugar ¾ cup/180 ml Water - 115℉ 1¼/175 gm cup Corn Starch 1 cup/163 gm Sweet Rice Flour ¼ cup/30 gm Tapioca Flour ¼ cup/27 gm Chickpea Flour 1 Tbs/9 gm Xanthan Gum 1 tsp/6 gm Himalayan Sea Salt ¼ cup/57 gm Melted Butter or for Dairy Free: Canola Oil 2 Tbs/43 gm Honey 3 Tbs/40 gm Sugar 4 large Eggs 1 Yolk (reserve the white to brush the top of the loaf) ⅛ tsp/0.5 ml Vanilla Extract FILLING 4 Tbs/57 gm Melted Butter or for Dairy Free: Margarine or Canola Oil 2 Tbs/12 gm Cinnamon ½ cup/86 gm Brown Sugar ½ cup/60 gm Chopped Walnuts or Pecans ½ cup/78 gm Raisins - soaked in hot water for 15 minutes to plump them. 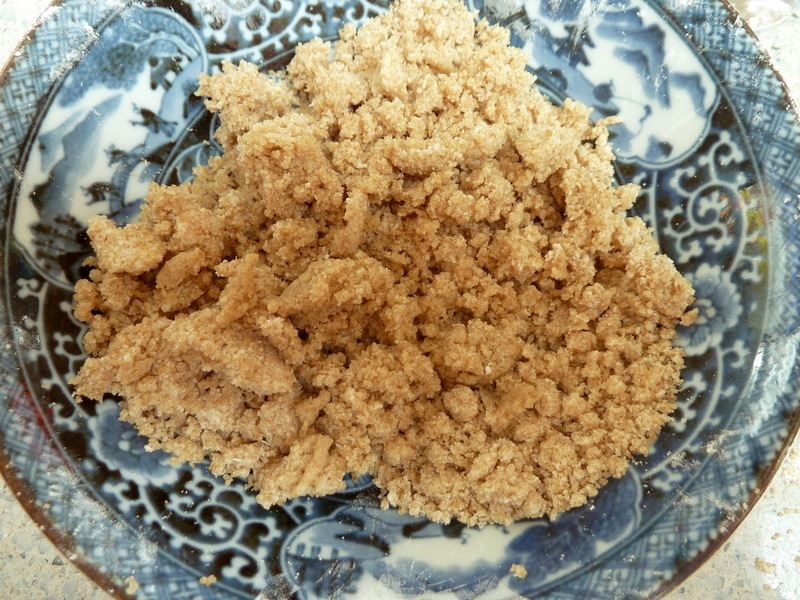 STREUSEL TOPPING ¼ cup/43 gm Brown Sugar ¼ cup/37 gm Corn Starch or Tapioca Flour ⅛ tsp/0.5 gm Xanthan Gum ¼ tsp/1.5 gm Himalayan Sea Salt 2 Tbs/28.5 gm Cold Butter or for Dairy Free: Margarine or Non Hydrogenated Shortening Directions Prepare a warm place for the bread to rise. I like to use a proofing box or make a proofing box out of the microwave. To use the microwave, fill a microwave proof bowl with water and place in the microwave and turn the microwave on. Allow it to heat for at least 10 minutes. I let it run until the dough is prepared. When the bread is ready to rise I turn off the microwave and place the bread pan inside the microwave with the bowl of hot water, shut the door and leave it to rise, do not turn on the microwave when the loaf is in the microwave. 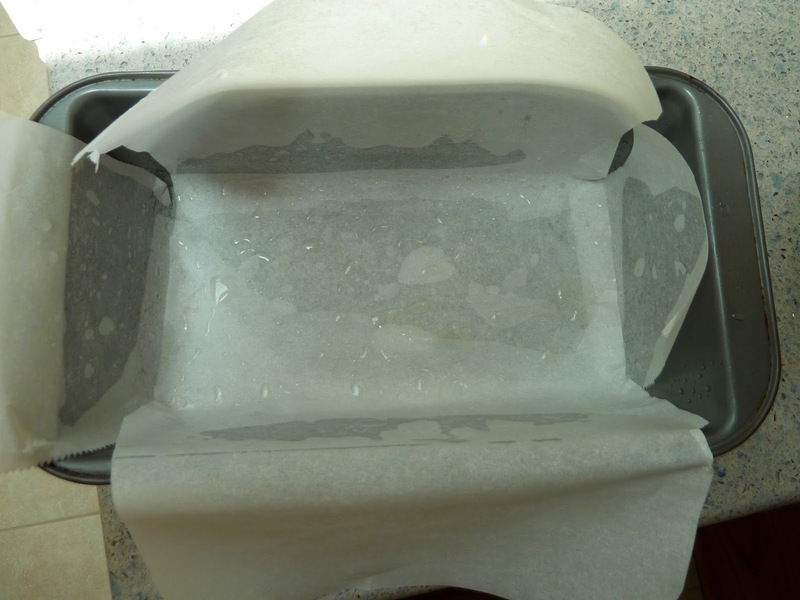 Prepare a loaf pan by greasing it and lining it with parchment paper, two pieces, one each direction. Then grease the parchment paper. Set aside. I used 9"x5" pans, a larger 10"x5" pan may have been better and prevented the overflow of dough during baking. Next Prepare the Filling: Melt the butter or margarine, set aside. Soak the raisins in hot water for about 15 minutes. Drain well and set aside. Chop nuts and set aside. Measure out the cinnamon and sugar, mix together and set aside. 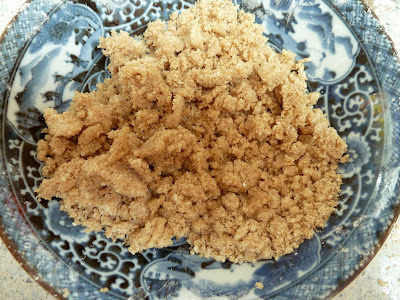 Next Prepare the Streusel Topping: In a bowl mix the sugar, tapioca flour or corn starch, xanthan gum and salt, mix well. Add the butter or margarine to the bowl and pinch the flour mixture and butter between your thumb and index fingers until you get a mixture with all sizes of lumps and some sand like mixture as well. Put in the fridge until ready to put on top of the loaf. 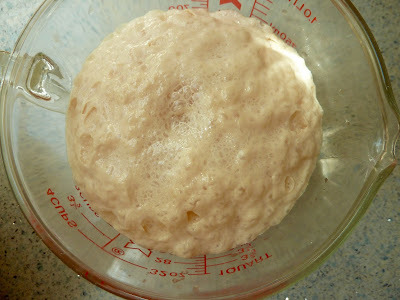 Next Make the Dough: In a small bowl add the warm water, yeast and 1 Tbs. sugar, mix and set aside. It should bubble and foam within 10 minutes. If it does not foam, the yeast is not fresh or active, or the water was too hot and killed the yeast. Start again with fresh yeast and use a thermometer to check the water temperature. In the bowl of a stand mixer add all the flours, corn starch, xanthan gum and salt. Mix well. Add the yeast mixture, melted butter or oil, sugar and honey, mix on low until combined. Add the eggs and vanilla and mix on medium until combined. Turn speed up to high and mix about 2-4 minutes until the batter is smooth. Next Form the Loaf: Place sheet of plastic wrap to cover the counter top. The plastic wrap should be about 20 inches long and 16 inches wide. Cover the plastic well with oil or cooking spray. Spoon the batter onto the plastic wrap. Use wet hands to spread the batter out into an 18” x 14” rectangle. 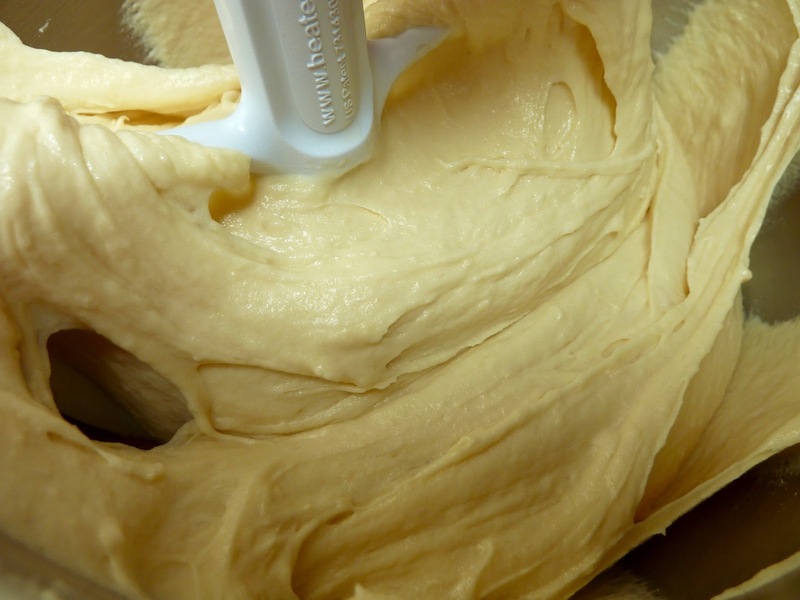 Spread the melted butter or margarine over the dough with a pastry brush, leaving a 1” border around the edges. Sprinkle the sugar and cinnamon mixture evenly over the melted butter or margarine. Scatter the drained raisins and chopped nuts evenly over the sugar mixture. Starting with the long end, use the plastic wrap to roll the dough into a tight log. If the batter sticks, use wet or greased fingers to scrape it off the plastic as you roll up the dough. Use the plastic wrap to lift the end of the log and fold the log in half. Bring the prepared baking pan close. Lift the rolled and folded dough with the plastic wrap and turn it into the baking pan. Brush the top of the loaf with egg white. Allow the loaf to rise for about 45 minutes until it reaches the top of the pan. Place one oven rack in the center of the oven and one below it with enough room for a baking pan to fit easily on the lower shelf. Preheat the oven to 350℉ (after the loaf has been rising for about 20 minutes). Place a baking pan with some water on the lower shelf in the oven. When the oven is at the correct temperature and the Babka has risen to the top of the pan prepare to bake the Babka. Take the streusel out of the fridge and sprinkle it evenly over the top of the risen loaf. Place the loaf pan on top of a baking sheet and place in center of the center oven rack. Bake for 45 minutes or until the internal temperature of the loaf is between 195 - 210℉. If the loaf is getting too brown during the last 20 minutes of baking, cover loosely with aluminum foil. When done baking, place the pan on a baking rack to cool for 7-10 minutes, then, using the parchment paper, lift the Babka out of the pan, to cool on the rack. You can serve it warm or cold. Slice with a serrated knife. Enjoy! There is no simple answer to your question. It took much experimentation in order for me to develope the mixture of flours that gave this bread its soft, moist and pliable texture. If you use Bob’s Red Mill GF mix I’m sure you will get a loaf of Babka, but I’m pretty sure that it will not be equal in texture to my recipe’s mix of flours. I have never used Bob’s mix so I can not say for sure how it will turn out. If you use it let me know how it turns out. Good luck in your baking adventures! Each gluten free flour has a different weight per US cup measurement so it is a bit complicated to convert the recipe into grams.